Last week, I wrote about the Museu de Favela and urban street art in Brazil. Using dance, painting and music, many artists in the slums of Brazil's major cities are trying to turn kids away from drugs and violence towards a more positive expression of their urban culture. In addition, I wrote how other favela dwellers are capitalizing on the unique cultural aspects of their poor community (including 'street art' painted on the side of their houses) to entice tourists in the wake of the upcoming 2016 Olympics in Brazil. Now, as you can see here in, Kabul street artists put the writing on the walls, young Afghan artists, encouraged by a group of international 'graffiti guerrillas' known as Combat Communications (you can find them on Facebook), are spreading messages and slogans using spray paint and funky script. 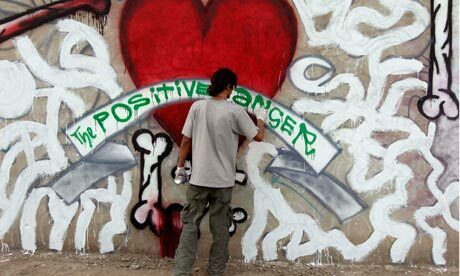 Contemporary graffiti artists as painters of 'raw art,' as political activists, anarchists and simply 'others' have been studied by anthropologists and sociologists, covered by art and news journals and commercially mainstreamed by galleries and museums in the art world (see Banksy). Adding to that, via graffiti, we now have Afghan 'outsiders' getting 'in'(to the world scene). Check it out. Some time this week Qassem will slip through the dark streets of a sleeping city. Well before the morning traffic starts to build up, the 24-year-old office worker will be home. But several street signs will have been subtly altered, roads will have slogans painted across them and a prominent wall will bear in large letters the words – "Why are we here?" Qassem is one of a small band of graffiti artists in the Afghan capital who, encouraged by a group of western "art activists", are set on bringing tagging, wall-painting and graphic stencils to public spaces across the city. "I'm going to edit a few traffic signs. Write slogans in big, funky script. Even paint across whole streets. The idea is to make people ask questions," Qassem said. Previously Qassem's efforts have been limited to spraying the name of a Swedish death metal band on the wall of the British cemetery, where casualties of previous interventions are buried. Many walls in Kabul are already covered in advertising slogans or fly-posting. There are also rare political slogans. "You can see 'troops out' and similar, but nothing creative or artistic. There are also massive public information campaigns, many funded by the government with money from the west. So we wanted to see the reaction to something different," said a member of Combat Communications, an anonymous Kabul-based group of international artists encouraging the movement. Eighteen months ago the group sprayed designs inspired by the British graffiti artist Banksy on walls of ostentatious new houses believed to have been built with the profits of the £3bn a year Afghan drug trade. A video on the internet brought an international response. Then images of an Apache attack helicopter, a Taliban insurgent, a tank, and poppies appeared in the city. Last December, Chu, a British artist, ran a week-long workshop on wall-painting in a disused industrial area on the outskirts of Kabul. "It was very good for us," said Ommolbanin Shamsia Hassani, 23. "We learned many new things." The interest in graffiti is part of burgeoning contemporary art scene in Kabul. One of the leading local artists is Amanullah Mojadidi, 40. Like most, including Qassem and Hassani, he was raised overseas, and came to Kabul after the fall of the Taliban regime in 2001. One recent work involved mounting a fake police checkpoint at which, instead of taking bribes as is habitually the case, cash was returned to bemused motorists "as an apology from the Kabul police for previous misdemeanours". The resulting installation, using film of the event, is called Payback and has been shown in Cairo, New York and now Mumbai, India. Mojadidi also created posters parodying former leaders of the resistance against the Soviet occupation of Afghanistan in the 1980s – many of whom have subsequently become extremely rich. The images, posted around Kabul, showed him dressed as a cross between a local leader and an American gangster rapper, complete with a gold-plated gun, emerald-tipped bullets and girls in burqas and bikinis. "Most were ripped down in days," said Mojadidi. Current work includes a project on suicide bombers and beards. But Mojadidi is planning to leave Afghanistan. He said space for independent contemporary art is being squeezed as international donors exploit the new creative activity. His own attempt to encourage graffiti led to disillusion. "I was trying to generate some genuine street art, but before it had even taken root I was contacted by a contractor for the American government working on a gender awareness project who wanted to use graffiti to raise consciousness of women's rights," Mojadidi said. The problems facing aspirant street artists in Kabul are many. Though security has improved, the Afghan capital remains chaotic and often lawless. "Everybody is scared of doing this [graffiti]. So I'm going to try to give them a bit of courage and go first," Qassem said. "Maybe when they see what I have done it will be a kind of breakthrough." Hassani – who paints as Shamsia – said women artists faced additional problems in what is still a deeply conservative society. "At the moment I do graffiti and wall-painting at home. [To do it] in the city is still a bit difficult, especially for girls," she told the Guardian. "This is not Europe."